Hospital chaplaincy was a part of the first five years of my priestly ministry 30 years ago. I must admit honestly that I was not looking forward to being on hospital call-out again after such a long time. A good priest friend (younger than me) brought me up sharply by saying simply "Well you get people into heaven." I should have re-read the section of my own sacramental theology notes where I observe that the doctrine of Trent was forgotten because of Jansenist rigour. 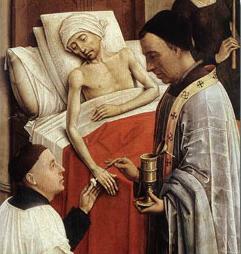 Cappello proposes that the primary end or purpose of the sacrament is to prepare the soul for entry into glory. In support of this, he cites the ancient Ordines which implored the mercy of God so that by the help of this sacrament, the sick should enter into heavenly blessedness immediately upon their departure from this life. He also refers to a consensus of the scholastics on the subject, quoting Albert, Bonaventure, Scotus, Durandus and others. He gives various passages from St Thomas including the passage that we quoted before regarding the defects that remain to be healed after the forgiveness of sin. There is a pattern to be discerned here. It is uncommon now to find such Jansenist aberrations as an excessive rigour in the confessional. However, some of the Jansenist errors that were not widely adverted to before Vatican II have, to a degree, persisted in practice. The doctrine of a perfect preparation for entry to immediate beatitude would be most comforting for many who are dying. Yet this component of our theological inheritance has been largely lost because of other considerations which have dominated thinking on this sacrament such as an over-emphasis on physical healing. So it is a wonderful thing to be called out to visit people who may have neglected the practice of their faith, yet have identified themselves as Catholic and can be assumed to have at least some habitual desire for the sacraments, and as a priest, to minister the sacrament of anointing and the Apostolic blessing with the plenary indulgence, and know that they have been helped on a fast track to heaven. Inevitably a discussion then arises over whether this is all a bit "Not Fair!" We can of course point out the uncertainty of the time of death, quoting St Augustine "God promises us His grace, he does not promise us tomorrow", and the possiblity that we die without the sacraments. We also know that the Christian life is one of great peace here on earth and brings greater genuine happiness than a life of sin.